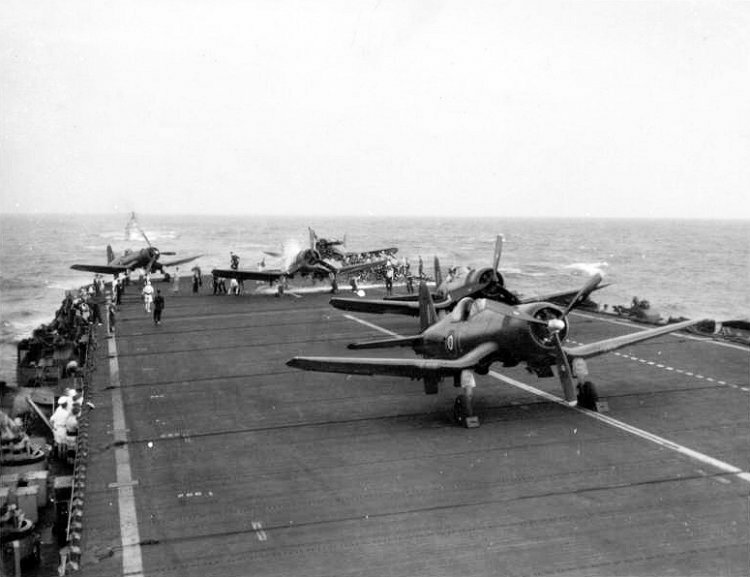 Corsairs ranged ready for take off. Photo courtesy Norman Phips. 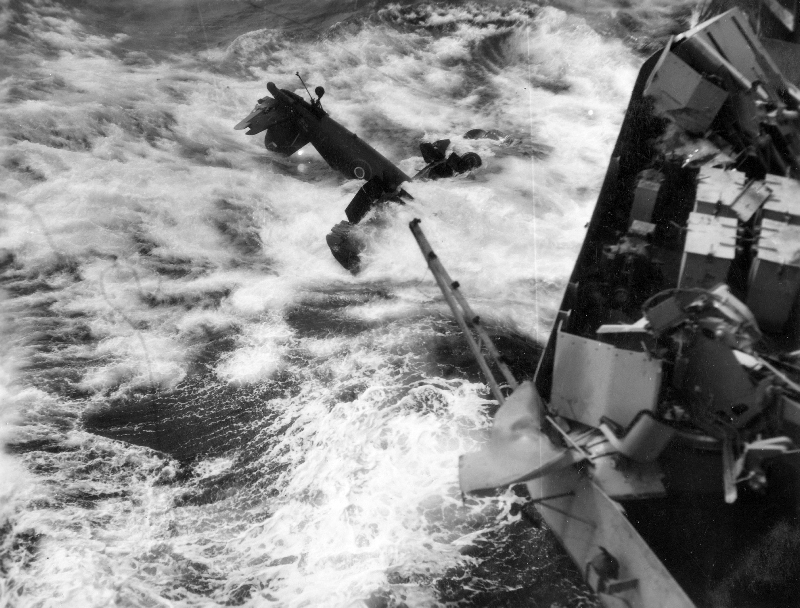 Above and below: The crash of CorsairKD611 February 22nd 1945. 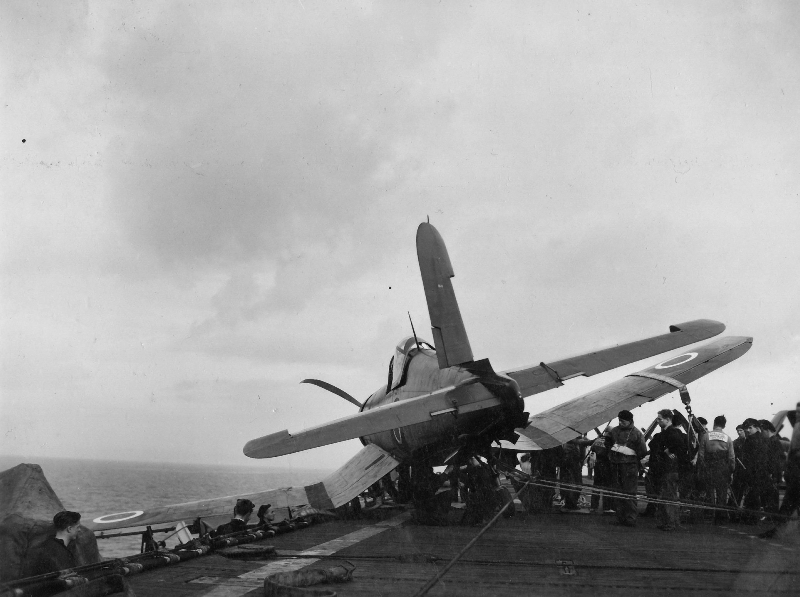 While landing on Sub-Lt B.G. 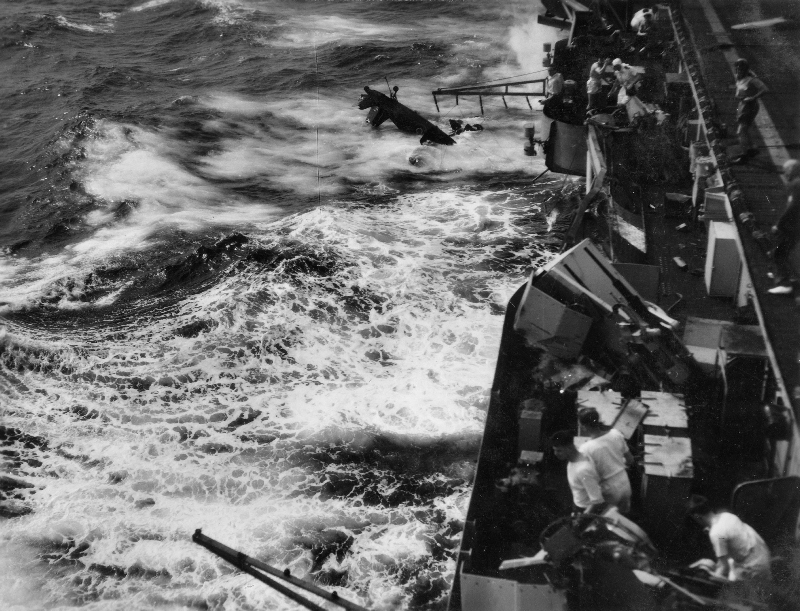 Appleton RNVR caught No.4 wire but drifted to port causing his port wheel to run into the catwalk. 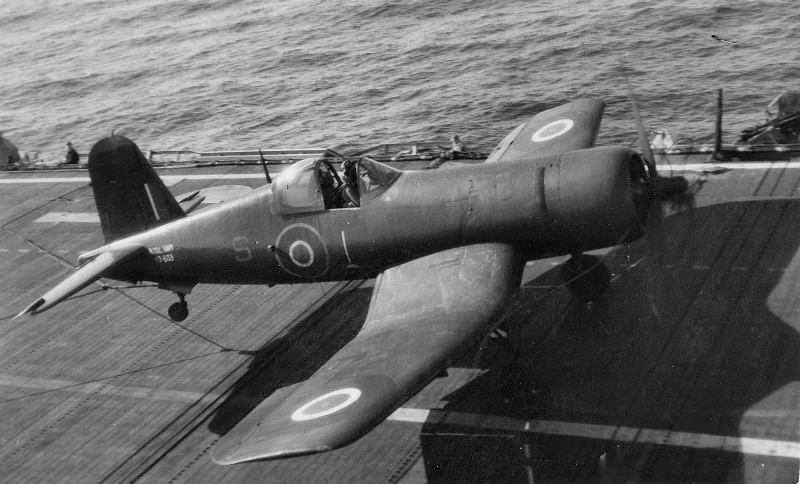 March 11th 1945 Corsair KD602 'S' flown by Sub-Lt D.A. Golding RNVR floats into barrier. 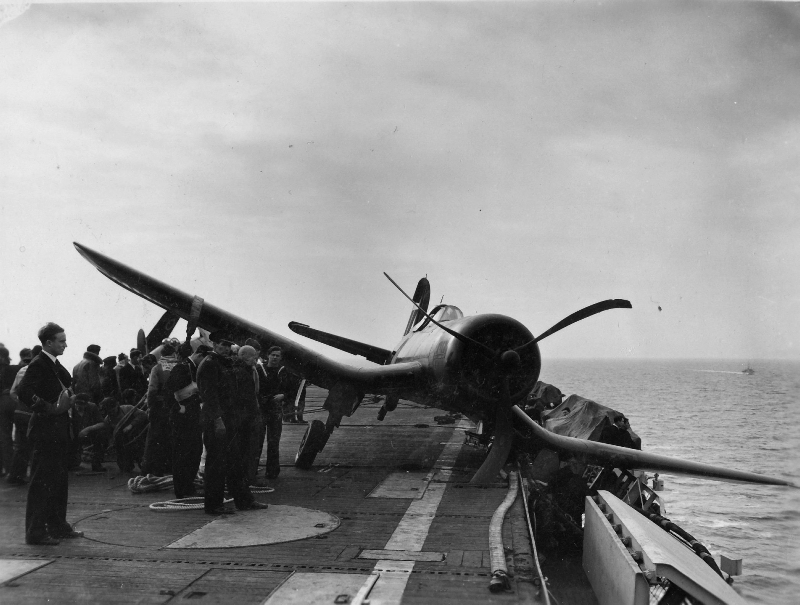 Above and below: The crash of Corsair KD578 'L' March 13th 1945.The aircraft hit the rounddown breaking the tail oleo off, before breaking through Nos.2 & 3 barriers The pilot Sub-Lt W. Noble was OK but the aircraft was write-off. 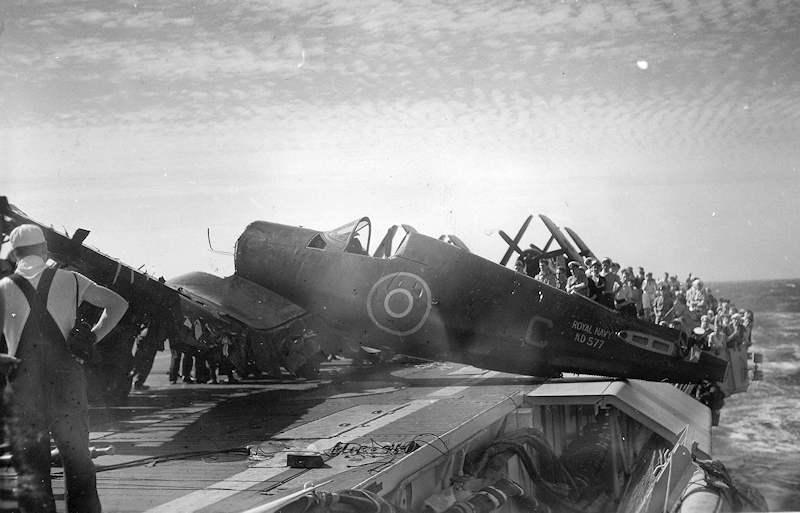 March 17th 1945: Corsair KD253 on its back after missing all the wires and clipped the top of the barrier which flipped it over. The pilot, Sub-Lt D.A. Golding RNVR was OK. 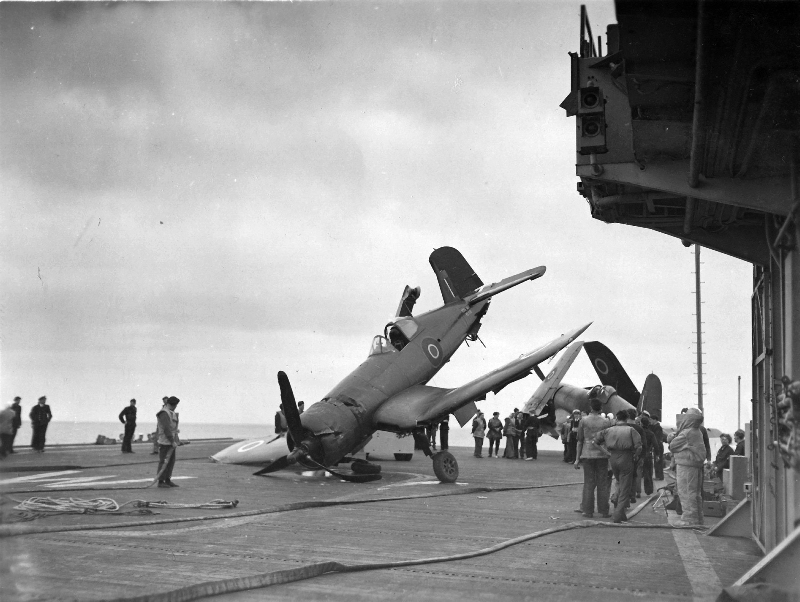 Above and below: The crash of CorsairKD607 March 22nd 1945. 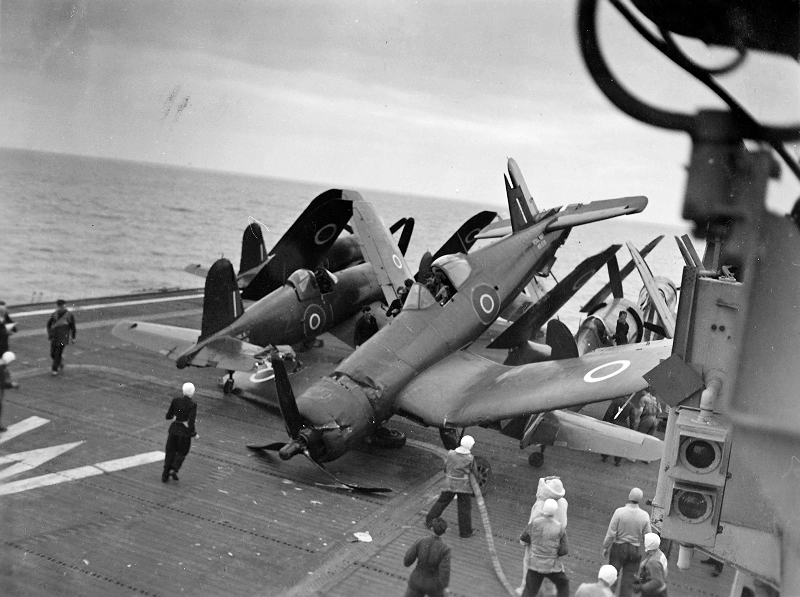 The pilot lost sight of Deck Landing Control Officer and flew into the starboard walkway and fell overboard. The pilot, Sub-Lt B.G. Appleton RNVR was safely rescued. 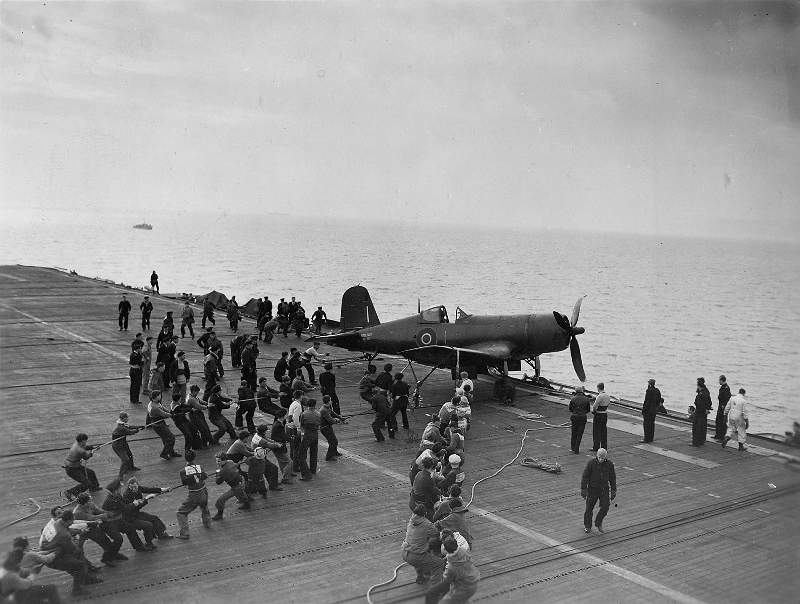 Corsair KD577 ('C') c. March 22nd 1945. 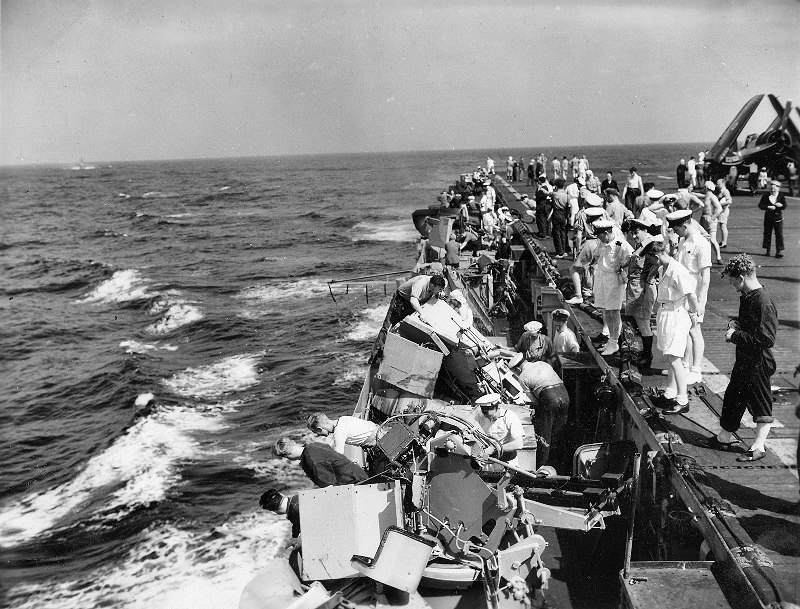 The aircraft had a nasty barrier crash on the 21st after Sub-Lt W. Noble RNVR drifted to starboard and entered the barrier. 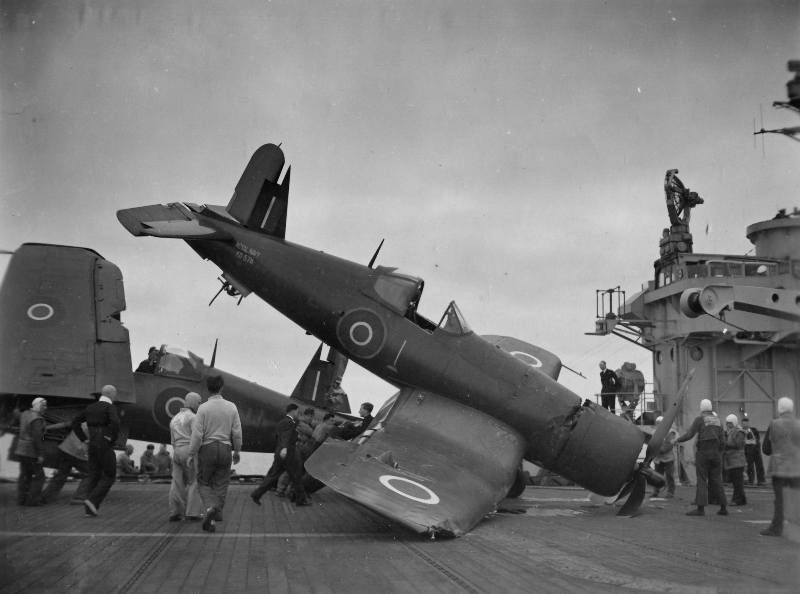 The aircraft was ‘beyond local repair’ and was stripped of all salvageable components before the hulk was pushed overboard. 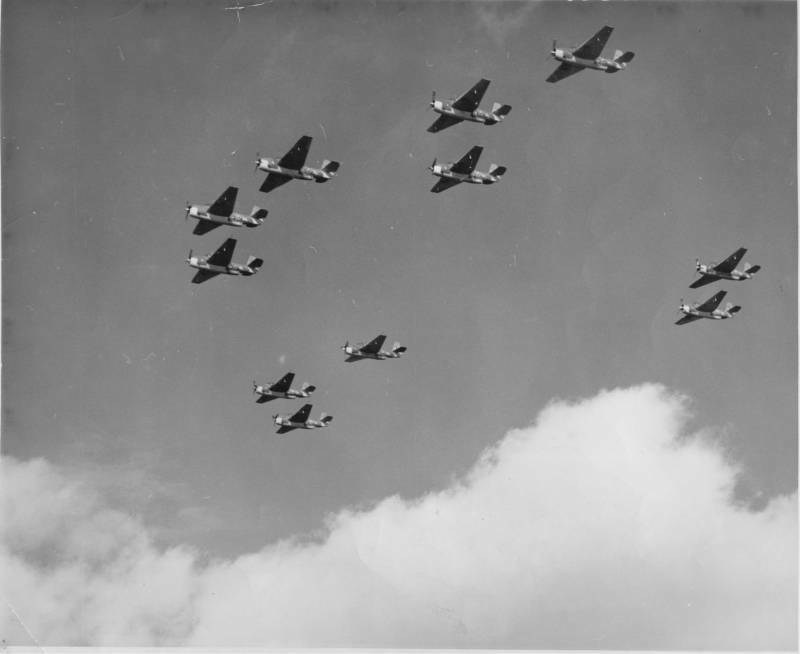 Aircraft of 1843 squadron in formation. Possibly on departure from ARBITER on reaching Australia. Photo courtesy Norman Phips. 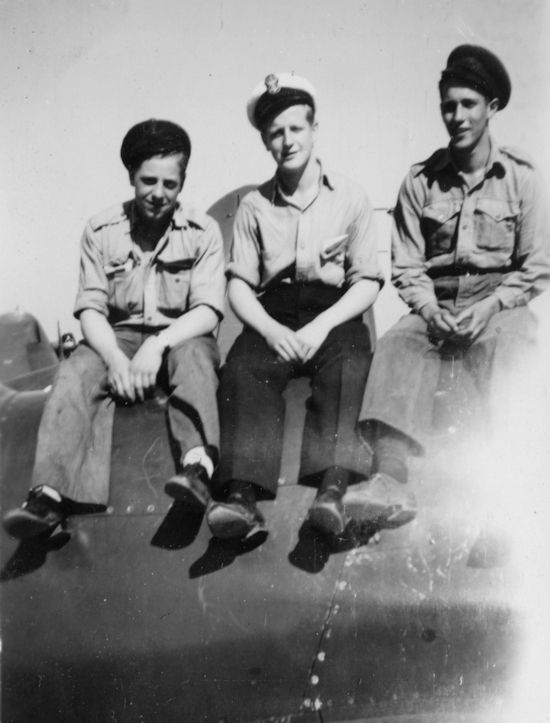 Members of 1843 squadron pictured at Schofields on VE Day, May 8th 1945. 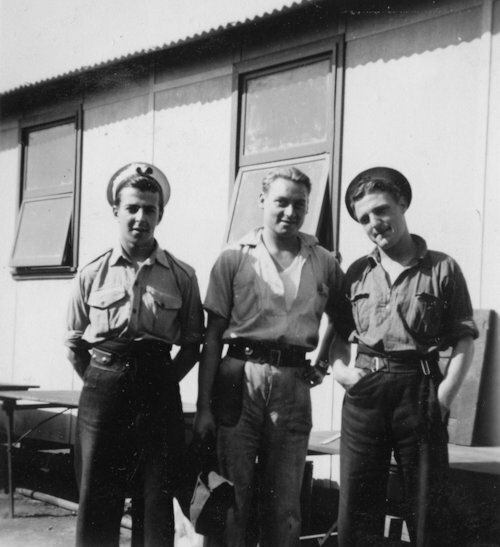 Petty officers of 1843 squadron pictured at Schofields, May 1945. 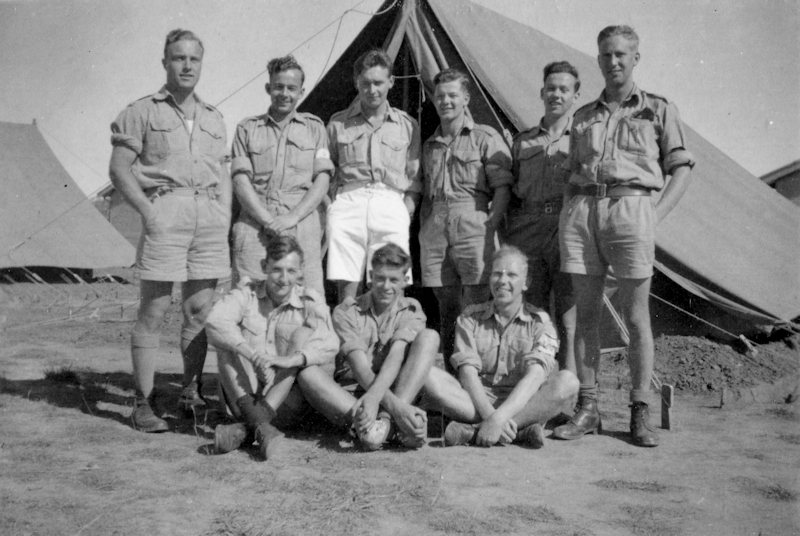 Members 1843 squadron Radio Section, RNAS Maryborough, July 1945.Members 1843 squadron Radio Section, RNAS Maryborough, July 1945. The “champions” the 1843 squadron football team, RNAS Maryborough, July 1945. 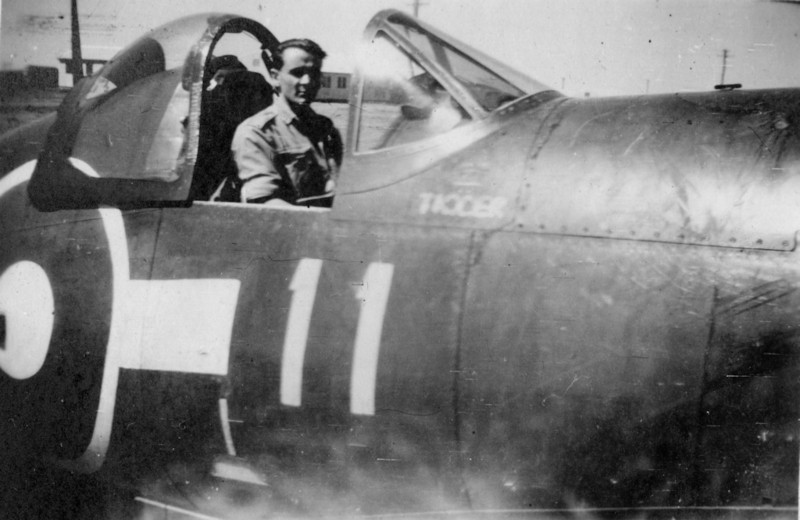 AM(O) 'Tug' Wilson in the cockpit of an 1843 Corsair at RNAS Nowra. 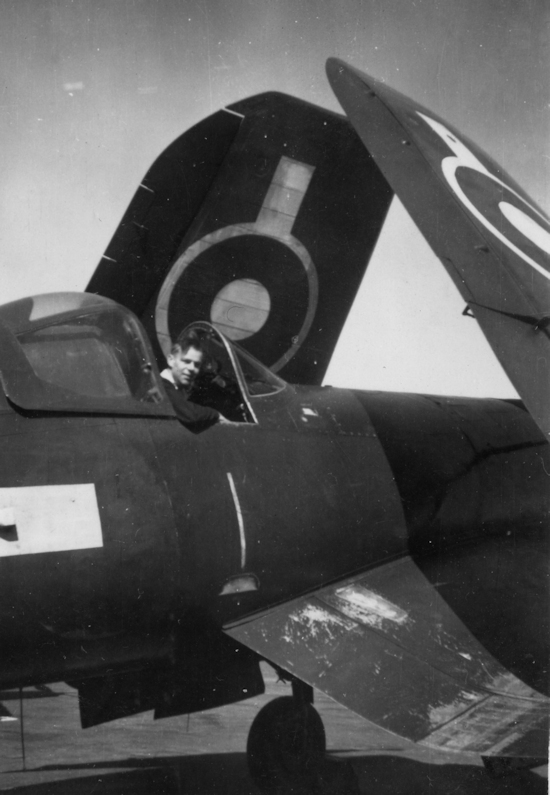 AA4(O) Maurice Ayling, in the cockpit of an 1843 Corsair at RNAS Nowra. 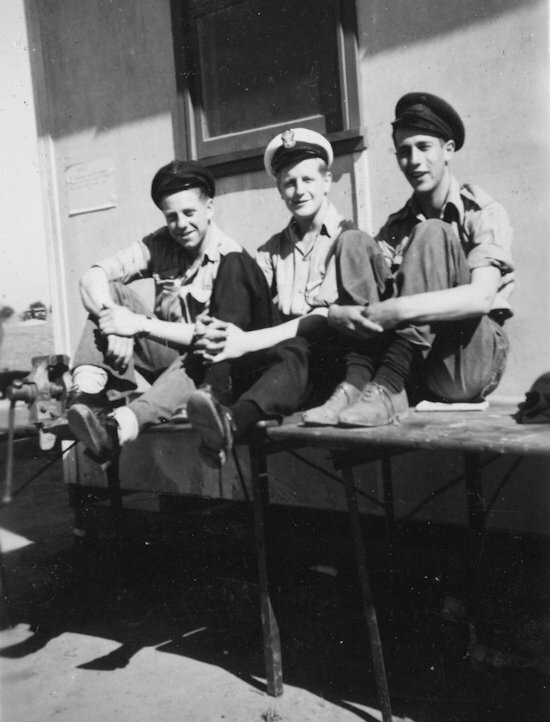 1643 Armourers at RNAS Nowra -'Tug' Wilson, 'Spike' Spicer, & 'Jerry' Rose..
H.W. Ellis, C. H. Allen, S.J. 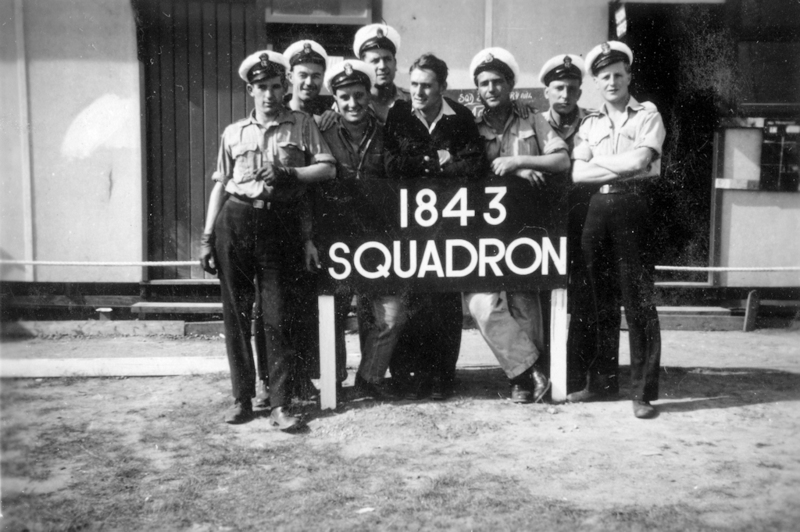 James AA4 (O)s of 1843 squadron at RNAS Nowra in the late summer of 1945. H.W. Ellis, C. H. Allen, S.J. 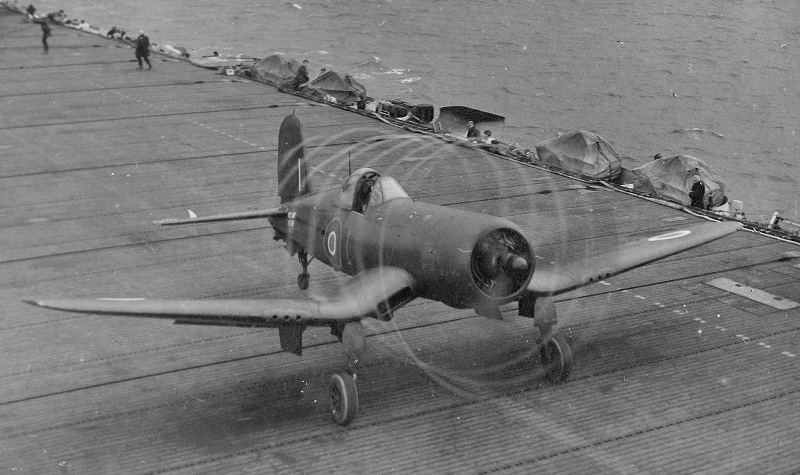 James AA4 (O)s with 1843 squadron pose an a Corsair at RNAS Nowra in the late summer of 1945. 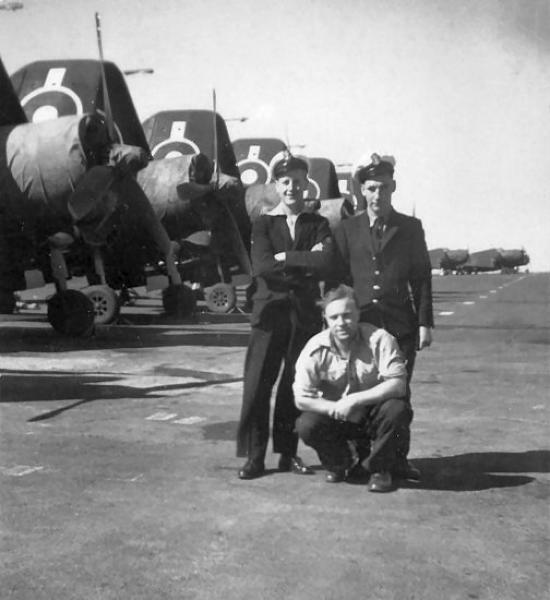 C. H. Allen, E. Bates, and R. Thomas (kneeling), AA4(O)s with 1843 squadron pose in front of the squadron’s Corsairs at RNAS Nowra in the late summer of 1945.